The “Juke In The Back” is proud to salute Sister Rosetta Tharpe, one of the most important and influential musical figures of the 20th Century. Tharpe, who was born Rosetta Nubin, was popular immediately after her first Decca Recordings in 1938. She gained even more exposure while singing in-front of Lucky Millinder’s big band during World War II. In 1944, she crossed musical barriers when her “Strange Things Happening Every Day” single crossed over to #2 on the national R&B lists, marking the first time a Gospel record had charted so high on a secular chart. Looking back, it’s not that surprising when you consider that Rhythm & Blues Music is basically secular content, sung in a Gospel style with rhythm accompaniment. 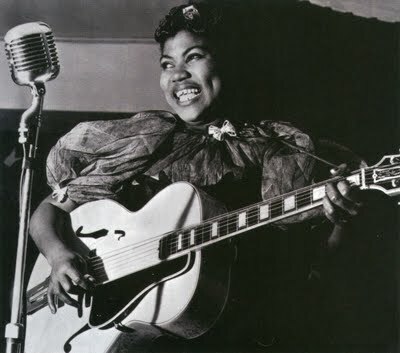 Not only did Sister Rosetta have an inspired, near-acrobatic vibrato voice, but she was also a virtuoso of the guitar. The novelty of a spiritual woman singing and playing the guitar soon gave way to her immense talents at doing both. This week, Matt The Cat presents Rosetta Tharpe’s charting singles as well as her most influential Gospel sides, which become some of the bricks in the foundation of both R&B and Rock n’ Roll. We’ll hear her recordings with Lucky Millinder, Sammy Price, Marie Knight, The Dependable Boys and the Rosette Singers as well as a few of her V-Discs. Hallelujah, this is going to be an inspired show. Can I get an AMEN!